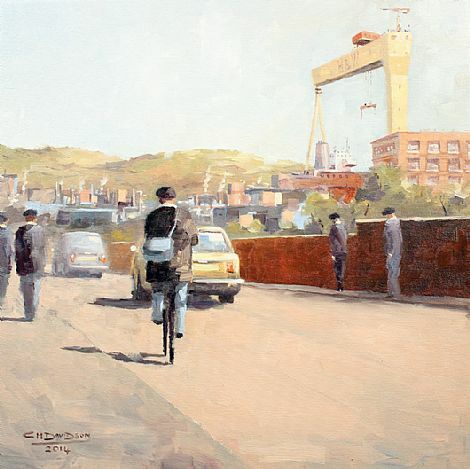 Born 1961, raised in Donaghadee Co. Down, now living in East Belfast. 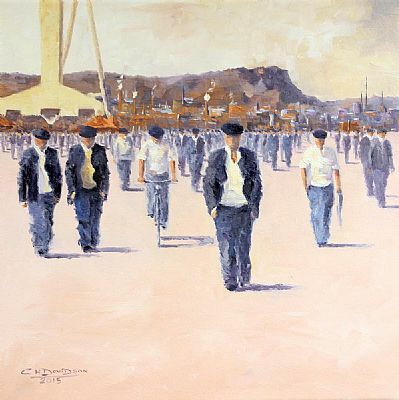 Colin has been interested in art most of his adult life and took up painting in 1982. 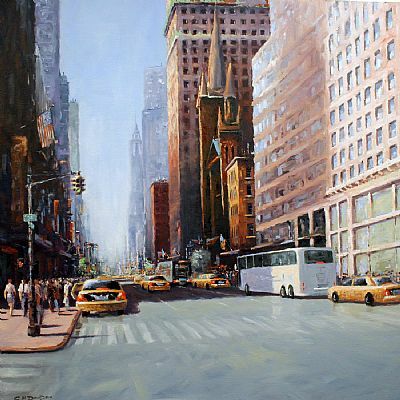 Mostly self-taught he attended a local college for a short period. It was there he realised that he had a slight colour blind imbalance with some green and brown colour tones. This frustrated him at the time but he soon learnt to avoid what everyone else could see. 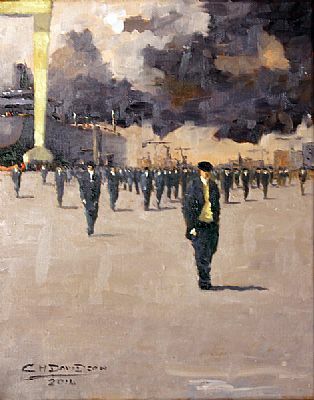 Most of his earlier work completed from 1983-1995 was related to ships, seascapes or cityscapes. He has also been involved with two amateur dramatic societies designing backdrops. 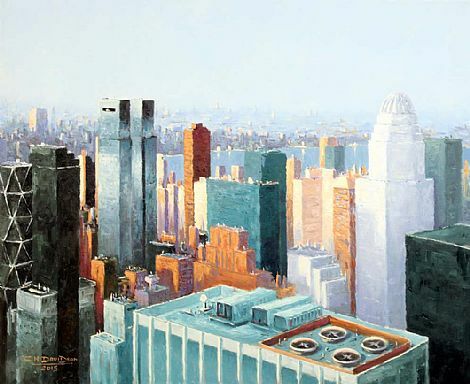 He is influenced by modern day impressionist, Edward Seago and Trevor Chamberlain and more recently by American modernist painter, Edward Hopper. He served a four year apprenticeship in Harland & Wolff from 1977-81 and a further nine years working in different departments leaving in 1990, now currently employed by Bombardier Aerospace as a Tool Design Engineer. 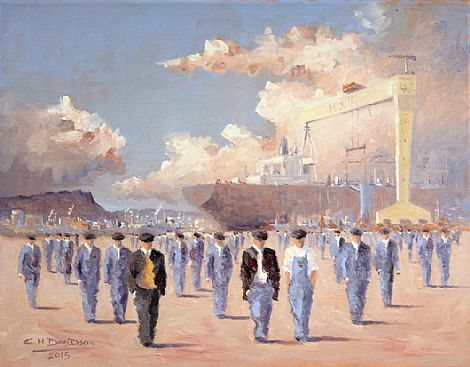 During those thirteen years in Harland & Wolff he had the privilege of working alongside some fine men who feature in many of his paintings, engaged in conversation, walking with intent, in squads of three to five men………..Foremen, Tradesmen, Apprentices with the odd Manager in the distance (or Hats as they were known as). What impressed him was the sheer size, complexity of the fabrication of shipbuilding that met your eye. 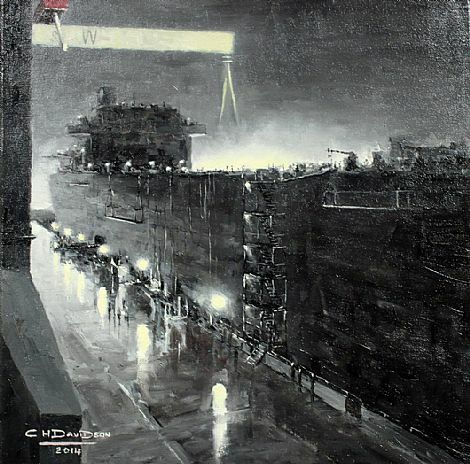 As an artist these sections of ships and cranes have given him a great deal of material to work from, offering a combination of abstract and impressionism on one canvas. The sense of camaraderie extended outside the work place also includes other shared interests. No more so than the football terraces of The Oval, home ground of Glentoran FC and only a stone’s throw from the Dee Street Bridge entrance to the Shipyard. 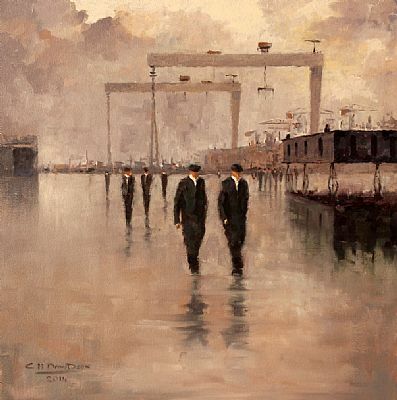 Speaking of his work, “We have a rich Ship Building and Engineering heritage in Belfast, the more research I do the more respect I have towards the men and woman who worked there and the hardship most families went through. 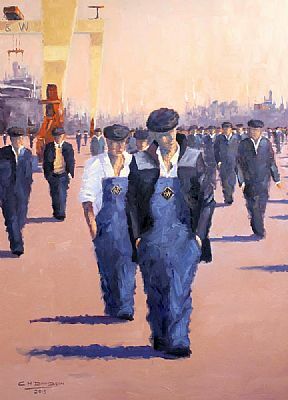 Harland & Wolff has changed dramatically since I left in 1990, but it hasn’t changed my memory. 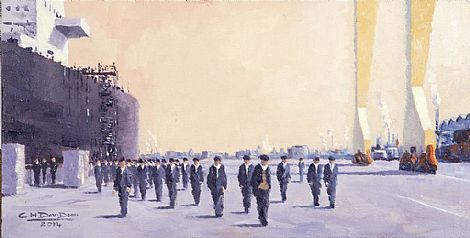 Over the last seven/eight years I have been painting scenes from these memories, which resulted in a sell-out exhibition in May 2009.